It turns out that Texas is surprisingly progressive on various criminal justice issues. As the Daily Appeal has pointed out, Texas has made good policies from bad mistakes. Laws named after sympathetic victims are often the worst form of knee-jerk legislation, leading to exceedingly harsh punishments and overcriminalization. [Ted Frank / Los Angeles Times] In Texas, however, several laws named for victims of state misconduct have put Texas on the forefront of various criminal justice reform efforts, including eyewitness identification and junk science. Texas police departments now use double-blind and sequential lineups, which have been shown to reduce mistaken identifications with little or no reduction in accurate identifications. A lawyer with the Innocence Project of Texas said, “In terms of conducting eyewitness identification, Texas is doing better than any state in the Union.” [Paul Kix / New Yorker] New York and other states have refused to adopt either double-blind or sequential lineups, despite overwhelming evidence that the procedures help identify the right person, which, in theory, is what lawmakers and law enforcement wants. The New York Times titled its editorial about discovery reform “How to Make New York as Progressive on Criminal Justice as Texas.” New York would, without a doubt, benefit tremendously from these and other changes. It would become fairer and safer. But those who have experience with the criminal system in Texas caution that legislative reforms are necessary, but in no way sufficient. The Daily Appeal spoke to Trudy Strassburger, senior legal counsel at The Justice Collaborative, who previously served as deputy director of the Capital Area Private Defender Service, in Texas. “The scientific writ statute is pretty amazing,” she said. “The language of the statute is amazing, but those writs rarely get filed because indigent defense is so underfunded here.” In general, the criminal court of appeals in Texas is “pretty horrendous,” and when cases on scientific writs come up for appeal, the judges have interpreted the law very narrowly. The situation is similar for discovery practices: “Even with great discovery rules, the lawyers say, ‘I’m not getting paid to sit for 20 hours and watch dash cam video,’” Strassburger says. “They’re paid a flat fee so they have every incentive in the world to finish the case as soon as possible.” And the judges rely on the prosecutors, she adds, to tell them how to interpret the law. The prosecutors claim it only applies to discovery after a case has been indicted, which is not what the law says, but judges have sided with prosecutors. For the most part, Texas lacks a culture of rigorous and zealous defense. In many parts of New York, however, such a culture does exist, and, in those places, we can expect Texas-like reforms to really make a difference. 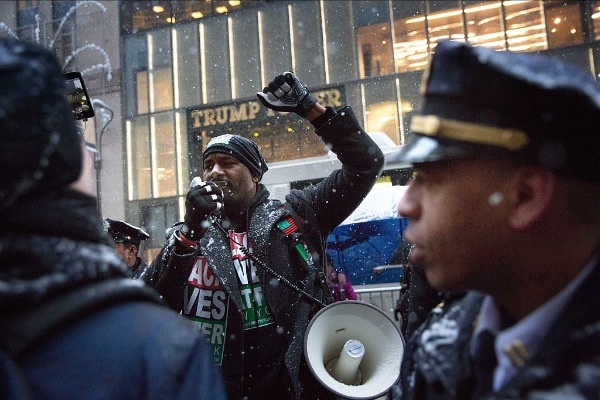 Black Lives Matter activists rally in front of Trump Tower on Jan. 14, 2017, in New York City. Thanks for reading. We’ll see you Tuesday.